I'm already decided to use Spring IoC in MR7. What I'm considering is Spring RCP. The motivation is to build the UI tier faster and also Spring RCP provisions - components and included/integrated libraries like JGoodies. Download Tortoise Subversion Client for windows (or your favorite one). While in the directory you have just created, click right button, get Explorer menu and choose SVN Checkout. and directory where to checkout. Proceed to the checkout by clicking OK.
Download and install Maven 2 (configure your PATH environment variable to run mvn from anywhere). If a repository item is not available (might happen), run mvn install again and again until it successfully finishes. Finish Maven2 installation by defining Eclipse classpath variable M2_REPO. Let Maven2 create Eclipse projects by running mvn eclipse:eclipse in the root of the project (c:\spring-rcp). Import projects to the Eclipse. Go to menu/File/Import.../Existing Project Into Workspace/ and select root directory (c:\spring-rcp). Eclipse will find several projects - import them all. 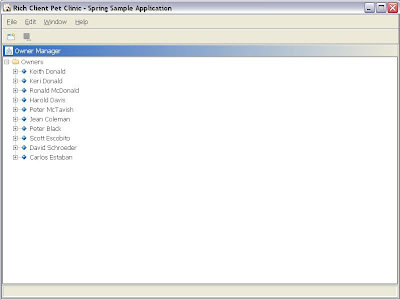 In package explorer open spring-richclient-petclinic-standalone project, find the package src/main/java/org.springframework.richclient.samples.petclinic. When you will be asked for username/passwd, just click Cancel.